National Trails Day: Visit Siloam Springs! 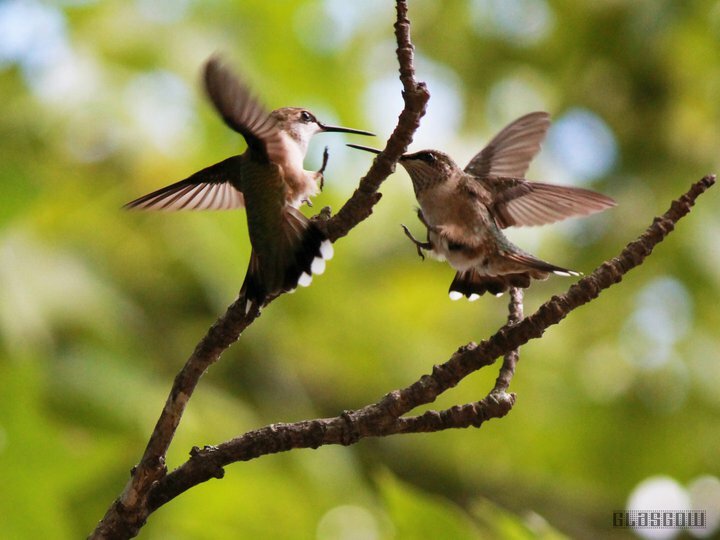 Photo by Brandon Glasgow of humming birds at Siloam Springs State Park. There are feeders in the parking lot by the boat launch area with many hummingbirds always around! This Saturday is National Trails day, and I’ve got good news if you’ve a mind to get out on local trails: the weather is going to be beautiful! Sunny, highs in the 70s- a perfect day to follow your Adventure Foot! Deer Run Trail runs near open prairie lands and is great for birdwatching! There are many, many good trails at every state park in the area, but I wanted to take a minute to highlight Siloam Springs State Park. The 3,323 acre park was purchased in the 30s and designated a state recreation area in 1940, but underwent major improvement in the late 1990s. The park provides ample ideas for fun- there are great shelter houses, a playground, around 12 miles of hiking trails, campsites with restrooms, showers and electricity or primitive campsites, 23 miles of equestrian trails, and a large lake which is stocked with largemouth bass, bluegill, sunfish, rainbow trout and more (you need to purchase an Illinois fishing license with trout stamp before fishing at the park.) At the lakehouse, you can rent canoes and row boats very affordably. There is also bait and tackle for rent. The park is only about a 30 minute drive from Quincy or a couple of hours by bicycle if you’re in the mood for a nice long (65 mile round trip) ride! I had the opportunity to visit Siloam last weekend, and was once again reminded how wonderful outdoor recreation close to home can be. My husband, my friend Clint and I headed to the park in the very hot weather to spend some time on the lake. We brought along a kayak (important note: if you bring your own kayak/canoe/boat you must have a current IL sticker to use the lake) and also rented a 2-person canoe. The canoe cost $8 per hour and included lifejacket rental. We had a nice time paddling around the lake and exploring each shoreline. I especially enjoyed seeing wildlife including several great blue herons and lots of turtles! After our paddle, we headed out to Crabapple Trail. This trail traverses 1. 5 miles of woodland, crosses a creek, and has neat outcroppings of limestone every so often. It’s also one of my favorite trails in the springtime for mushroom hunting. If you’re looking for a nice easy hike that you could do with a family, Crabapple trail is a good one to try. It starts and ends in the parking area by the lakehouse, so its location is ideal. 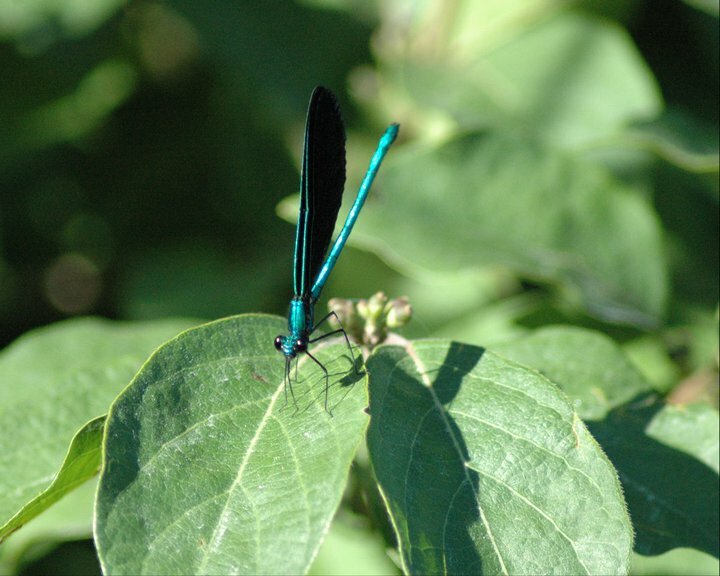 Emerald Jewel Wings are common around the lake shore. 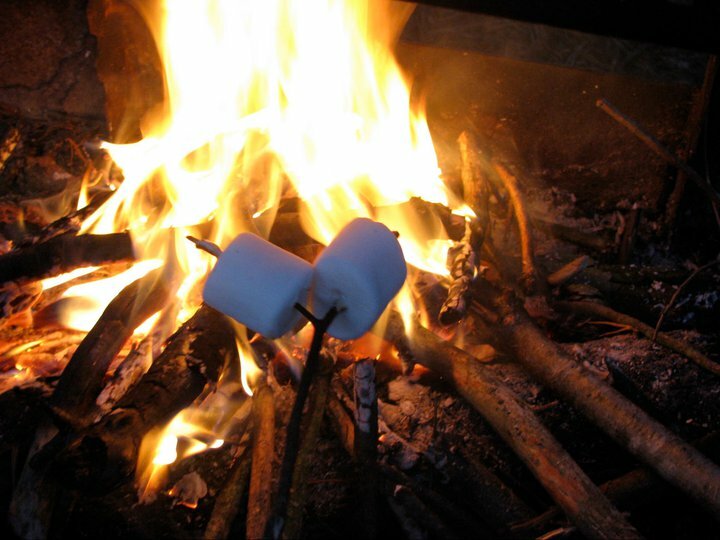 Mmm marshmallows! 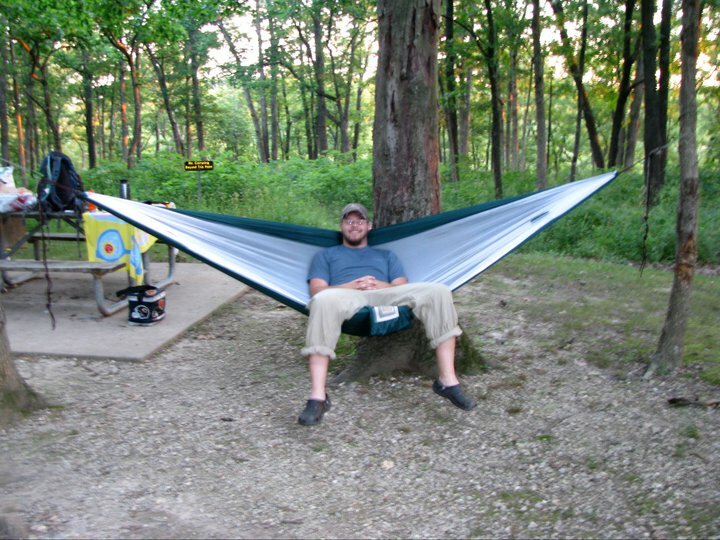 There are great campgrounds at Siloam Springs! Another good route to try, especially for groups of adults or those with older kids along, is a combination of the Deer Run, Hoot Owl and Old Village Trails. Deer Run Trail picks up at the Ranger Station and heads past some open prairie and down a moderate hill to the main Springs area. The prarie area is a great place for bird watchers- there are purple martin boxes and I’ve spotted indigo blue buntings, many types of finch and woodpeckers and even Baltimore Oriels in this area. When you get to the end of this trail you’re at a great little creek. I highly recommend fossil hunting in that area! There are lots of shells, snails and crinoid fossils to be found in the creek bed. 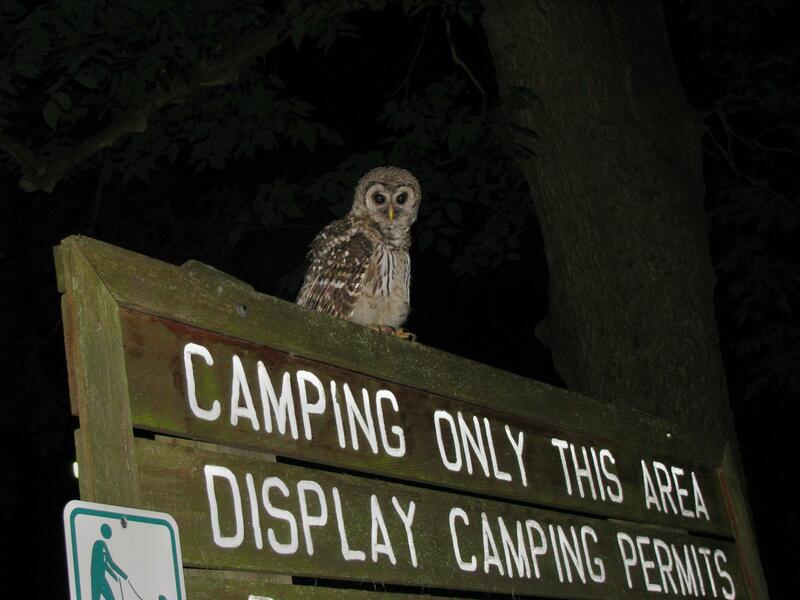 After fossil hunting, you cross the park area and pick up the 1.5 mile Hoot Owl Trail. This trail goes steeply uphill for a few hundred yards but is fairly easy after that. I like it because it’s got the best view of the valley in the park, and also a dense stand of pine trees where I always spot deer or red tail hawks. When you exit Hoot Owl, cross the county line and the bridge and, maybe after a stop for a picnic lunch at the shelter house, go find the Old Village Trail. This short trail will take you up the bluff and back toward the Ranger Station where you started. The whole loop ends up being 3-3.5 miles and will give you a great tour of the entire park. I hope you get out and enjoy some trails this weekend. Remember to keep our parks clean and leave no trash behind. 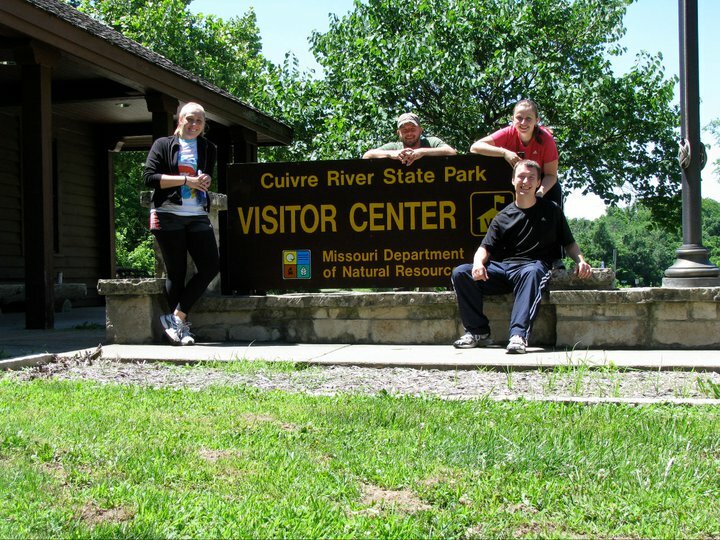 If you’d like to read more about another close-to-home State Park- check out this blog from last year about Cuivre River State Park in Troy, MO (1.5 hours from Quincy). For more info on Siloam Springs including campsite fees, hunting regulations and other amenities, click here! 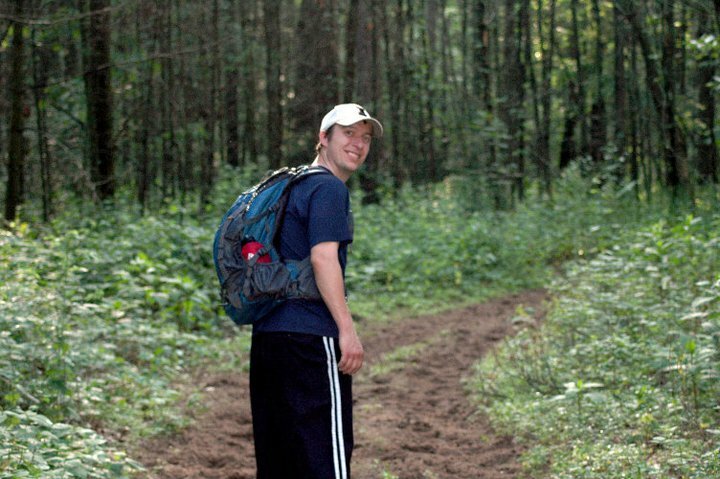 Justin Sievert hikes on Crabapple Trail. Siloam Springs State Park used to be like the jean jacket in the back of my closet. I always knew it was there, I just didn’t think I had much use for it. But in the last year, I’ve dusted off the jean jacket and headed out to Quincy’s closest state park for some of the most accessible, most affordable fun a person can have in the Quincy area. 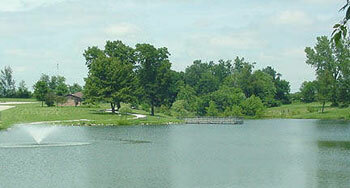 The beautiful 3,323-acre park is an ideal spot for anyone who enjoys the outdoors. The park is perfectly suited to hunting, fishing, camping, boating, picnicking, bird watching, playing on the playground with the kids, or for a great hike. There are no fees, save for hunters or boat rental. Hiking is my preferred activity at state parks, and Siloam Springs has got everything I need. The trails are all easy to moderate for most hikers, with only a few that present noticeable inclines, and none that risk much in the way of hazards. There is a wide variety of trails, that range from the just under a mile long Old Village Trail to the 4 mile long Red Oak Backpack trail. My most traveled route is a combination of the Deer Run trail (which starts right at the parking lot of the ranger station), to the Hoot Owl Trail (which features the park’s steepest incline, but rewards you with beautiful views over the ridges), and then back up the Old Village trail. This 4 mile loop offers a variety of views, different trees and habitat, a nice spot along the creek to eat a lunch or fossil hunt in the creek bed, and it crosses one of the main park and shelter house areas if you feel like playing on the swing set for a few minutes. You might think that trail hiking is an activity best saved for warm summer months, but let me give you a few good reasons to get out to the park sooner than later! First: No bugs yet. No bug spray, no mandatory tick check when you get home, no flies or mosquitoes, and fewer spider webs to stick on your hat. Second: Quiet. You’re not going to run into a bunch of other hikers. Third: Wildlife! Jays, cardinals, deer, hawks and the occasional owl are the winter inhabitants of the park, and the lack of foliage make the viewing that much easier. The red tail hawk calls in the area rang out like bells, and deer moving through the trees are easy to hear and easy to spot. My day-pack for hiking at Siloam includes a couple bottles of water, a camera, gloves and maybe a sack lunch. In the winter and spring, waterproof shoes are pretty critical, as portions of the trail will be soggy, particularly after snow melt. I also recommend bringing an extra layer of clothes even if the day is nice. Weather can change fast this time of year, and once the sun starts to go down, so will the temperature. Stay tuned for my follow up article on why morel mushroom hunting at Siloam Springs is the best part of Spring, but don’t expect to find out where my top-secret-awesome mushroom spot is at the park, because I’m not telling! Eastern Fence Lizards can be found in Sand Ridge State Forest. It’s the closest park to Quincy and has hiking trails that are just lovely. The boat house opens this weekend, so we could rent canoes or a john boat and enjoy Crabapple Lake. I know there are lots of nesting birds around the edges of the lake too, so maybe I’d get a chance to see some fuzzy baby geese or something! Siloam is always a good choice for a near by adventure. 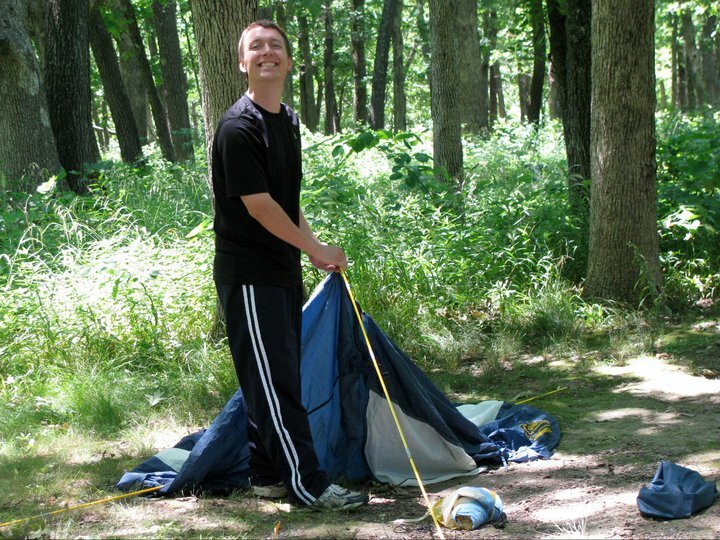 Justin Sievert at Argyle Lake State Park in both the winter and the spring. This state park is also quite close to Quincy. It’s just outside of Colchester, IL, and is one of the area’s best-kept secrets. The park features nice amenities including nice spots to camp and the hiking trails make different loops around and near the lake. There have been several improvements to the park lately, including the addition of stairs on parts of the trail that were in areas that are steep and can wash out in the rain. There is also a self-guided interpretative trail near the lake with info-graphics that describe the lake ecosystem. I love a good info-graphic! This park is also one of the few in the area with designated mountain biking trails for the intrepid weekend warrior! 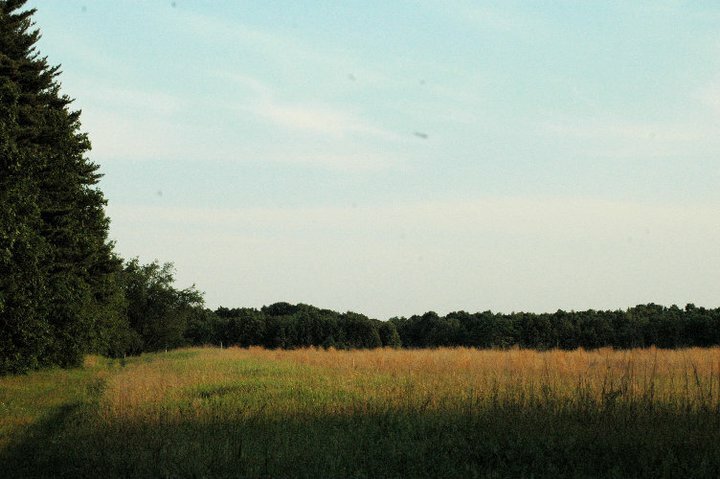 At 7,200 acres Sand Ridge is the largest state park in Illinois. It’s in Forrest City, Illinois, which is in the general vicinity of Peoria. This park is wholly unique to Illinois. It is a backpacker’s dream with over 26 miles of trails and 120 miles of fire lanes that can all be explored. There are registered campgrounds as well as rustic backcountry sites that can make this park a real outdoors experience. 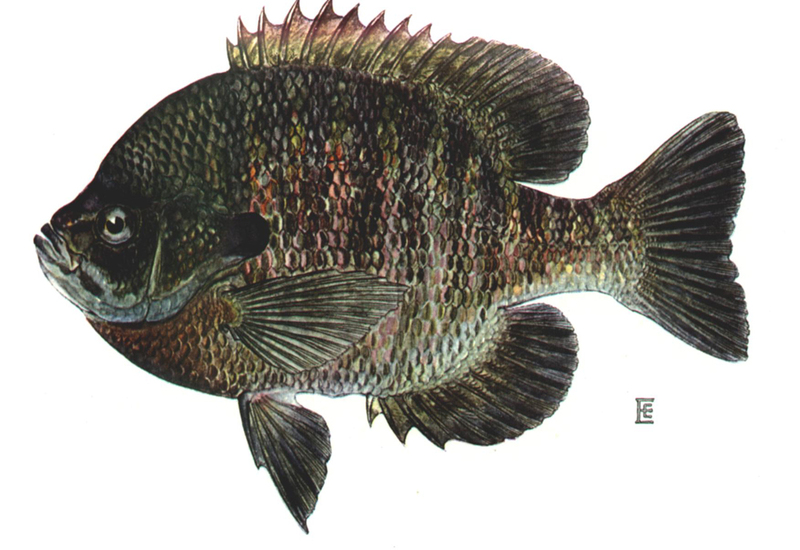 The ecosystem of the park is unlike the rest of the state. Thanks to the receding glaciers of the last ice age dumping millions of tons of sand on the area, as well as a prehistoric dry period in the state’s history, the forest is actually considered temperate desert or “Sand Prairie.” The unusual make-up of the soil supports plants and animals unseen anywhere else in the state. There are badgers, pocket gophers, fence lizards, prickly pear cactus, bur oak, and many more unusual species. 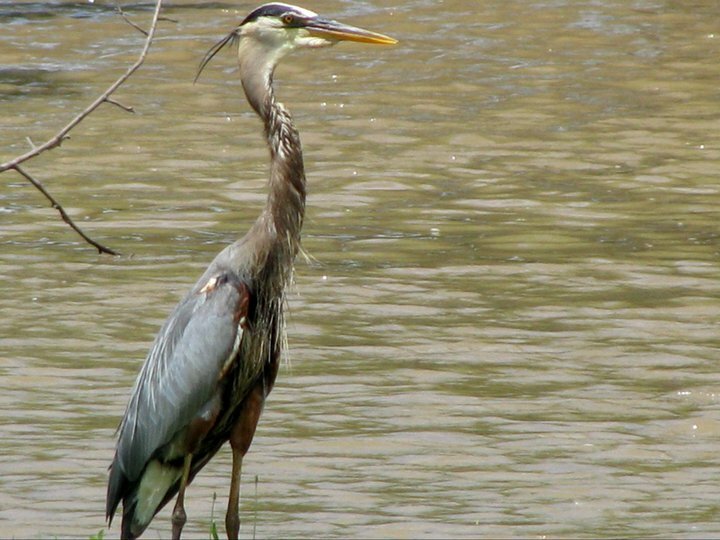 The area is also known for its bird life and includes semi-tropical migratory birds like indigo buntings, verry, ovenbirds, and scarlet tanager, along with Illinois game birds like quail, dove and pheasant. Question Mark Butterfly at Argyle Lake State Park. I blogged about this Troy, Missouri park just a few weeks ago, but I just can’t say enough about it. 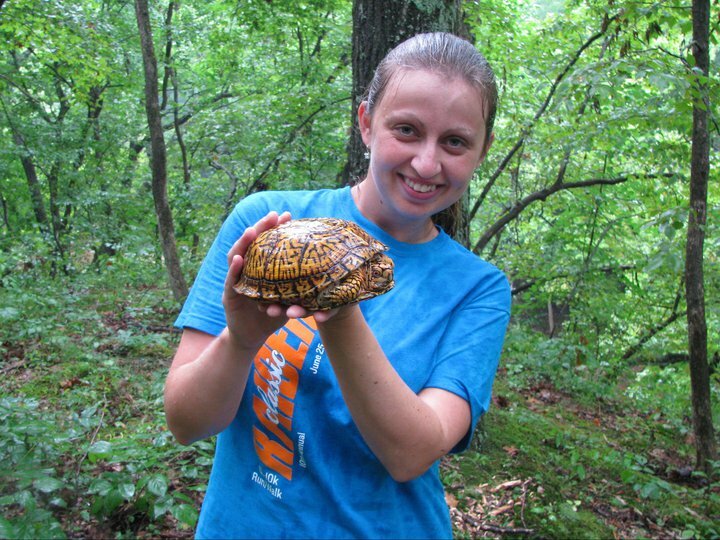 The trails are great, and the wildlife is even better. 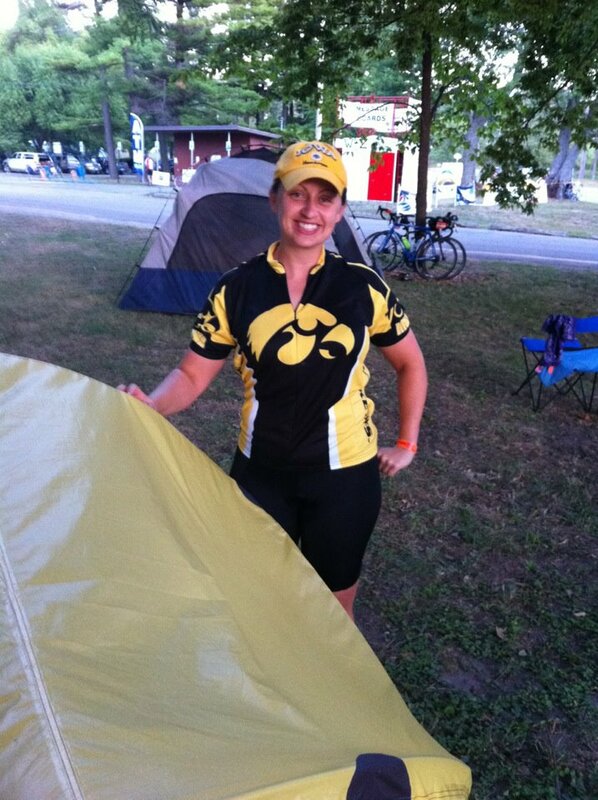 The campsites are nice and flat and all have fire pits and grill covers, and maybe best of all, there are shower facilities that are included when you pay the $12 fee to camp. Now that it’s warm, the lake and beach will be open. That means swimming and lounging around to soak up some rays! The park rents paddleboats and canoes, so there are plenty of ways to beat the heat. As if all of those things weren’t enough, Ranger Talks start this weekend, and you can listen to the experts tell you more about the wildlife of the park. Who knows, I may even bring my bike if we go to this park, because the roads through the park also make a lovely ride. So there you have it. It’s a good list of options, and now all I need to do is make a choice. I said this on my first blog, but it’s worth saying again: we live in amazing part of the country. All that’s asked of us is to “Get Out” and explore it. Have a great weekend everyone!